Mr. Nashville: Blake Shelton and Ray Price, Peace Meeting? 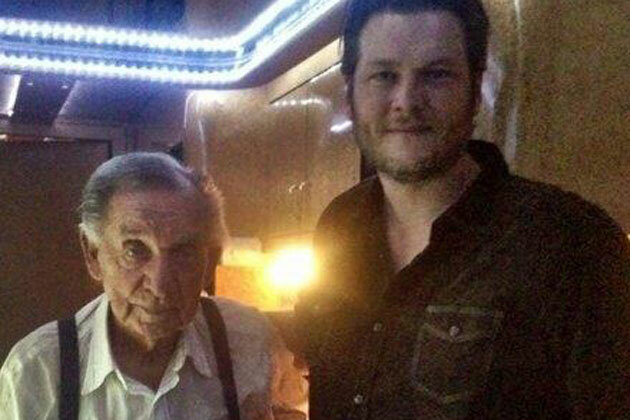 Blake Shelton and Ray Price, Peace Meeting? "Country music binds us together! We are a family. Forever and always. Tonight was a celebration of friends and heroes," were the words used by Miranda Lambert, when she posted this photo of her husband, Blake Shelton and Country Music Legend, Ray Price. Ray Price, recently wanted folks to know that the offer for Blake Shelton to open his show, didn't come from him, but the promoter. I made that clear in my post but some folks jumped on Ray, through social media, when they heard from other outlets that Ray made the request. I still think Blake should do it! Jimmy Carter reported on the radio this morning that Blake came on stage to make his peace summit known to the Ray Price fans out there. Wonder if he got any boos? We all know the truth here. He is only sorry (if he is sorry) because of the uproar which translates to lost revenue.